How can I convert the column headings in the worksheet from letters (A, B, C...) to numbers (1, 2, 3...) in Surfer? There is not a way to convert the alphabetic column headings in the worksheet to numeric headings in Surfer. To add your vote to this request on our suggestion file, please email surfersupport@goldensoftware.com. Open the worksheet in Surfer. Highlight row 1 and click Data | Edit | Insert to insert a blank row at the top of the worksheet. Click Data | Data | Transform. 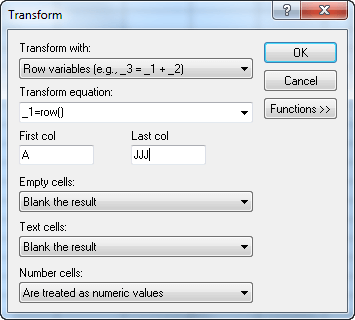 Select Row variables from the Transform with dropdown list. How can I convert the coordinate system of raw data, such as from UTM to Lat/Long using Surfer? What's new in Grapher Preview? How can I create a bar chart in Grapher with bars that are stacked and adjacent?